A State of Grace. - Mississippi Believe It! Home » Resources » Campaign » A State of Grace. Mississippians are givers. Our generous spirit is almost unrivaled. And in 1995, the world took note of that generous spirit through a single, unselfish act. 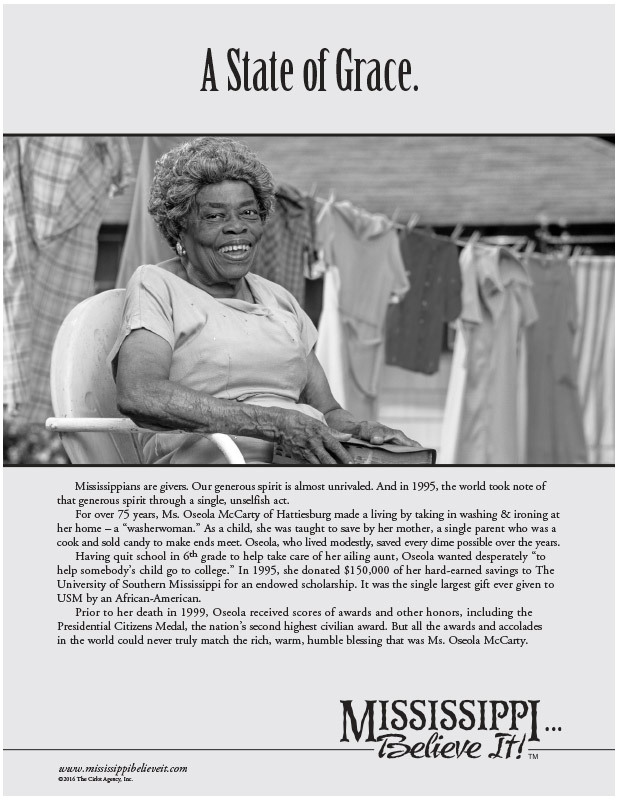 For over 75 years, Ms. Oseola McCarty of Hattiesburg made a living by taking in washing & ironing at her home – a “washerwoman.” As a child, she was taught to save by her mother, a single parent who was a cook and sold candy to make ends meet. Oseola, who lived modestly, saved every dime possible over the years. Having quit school in 6th grade to help take care of her ailing aunt, Oseola wanted desperately “to help somebody’s child go to college.” In 1995, she donated $150,000 of her hard-earned savings to The University of Southern Mississippi for an endowed scholarship. It was the single largest gift ever given to USM by an African-American. Prior to her death in 1999, Oseola received scores of awards and other honors, including the Presidential Citizens Medal, the nation’s second highest civilian award. But all the awards and accolades in the world could never truly match the rich, warm, humble blessing that was Ms. Oseola McCarty.